But this year, I vowed, I was going to take Valentine’s Day back and make it something meaningful for myself. I found inspiration in my son’s kindergarten Valentine’s Day school assignment. Instead of mass producing a batch of Teenage Mutant Ninja Turtles valentines, my son was charged with creating “valengrams” for his class. On individual scraps of paper, he had to write why each class member was special. It was a great (albeit time consuming) exercise in penmanship and time management, but more important, he had to think about something he valued in each of his classmates (i.e. you let people join your games, you help clean up messes that aren’t yours, you are kind and friendly, etc.) What an amazing skill to be developing as a kid. And the joy and pride my son felt through reading the valengrams he received was the cherry on top. For my Valentine’s Day project, I scavenged some leftover, paper hearts tucked away in a drawer. I wrote messages on each one, like the ones below, and folded them up with “open me” written on the outside. Then, the real fun began. Over the past week, I left about two dozen valentines wherever I went. In lunchroom and cafe tables at the university where I work a few days a week. Wedged inbetween apples at the produce section of the grocery store. At the library. The drug store. My dentist’s office. The hearts became a trail of where I had been. And it became a game to find places to leave them where they would be discovered, but where I wouldn’t be caught leaving them. It brought a sense of sneaky levity to my day. I even got my son in on the fun. Running or errands or going to get lunch became a chance to leave a heart somewhere. I felt like some sort of Valentine’s Day ninja, secretly spreading love far and wide. I have no idea whether the hearts will be discovered. My hope is the right people will find their messages. But the act of planting anonymous valentines gave me something. And in the process of becoming the Valentine’s Ninja, I think I reclaimed Valentine’s Day for myself. Posted in education, love, Parenting. Happy two-days-after-Valentine’s Birthday! 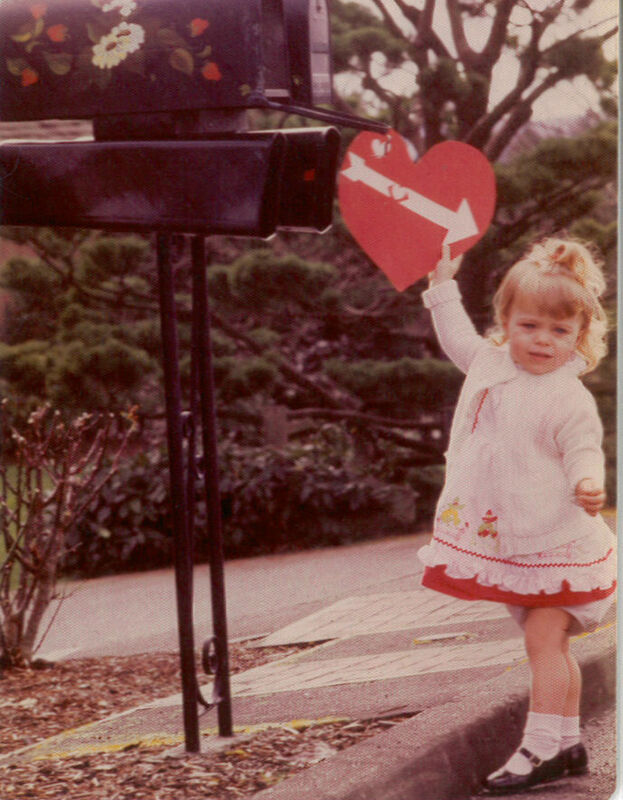 Just like when you were pint-size, you’re still delivering hearty messages. 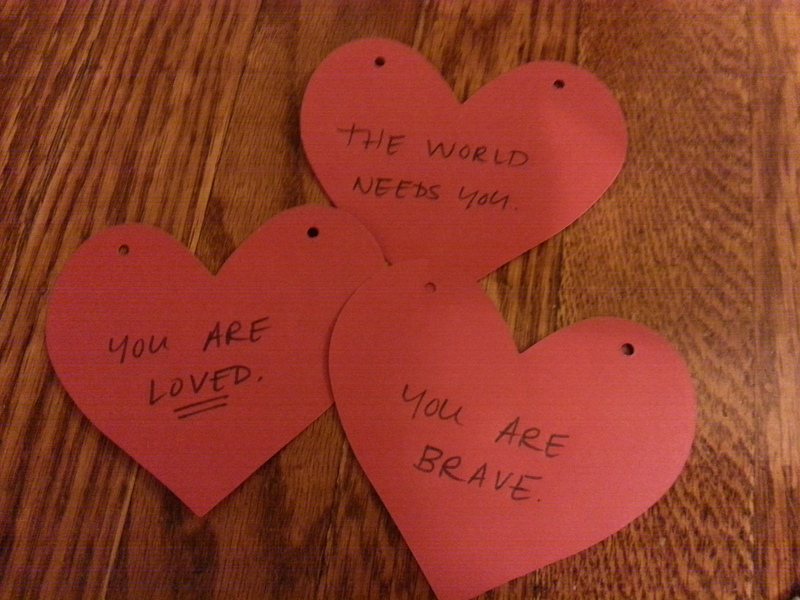 What a nice thought to leave words of warmth in unexpected places, like viral Valentines spreading the spirit. Your heart is in the right place…or places! Bravo! I love it. Thanks for taking this international, Kerry.